LUXUROUS FAMILY FRIENDLY HOME WITH OCEAN VIEW, POOL, STAFF & AIRPORT TRANSFERS! No matter how you define paradise, The Big White Villa will redefine it! Classic extraordinary old-world luxury meets contemporary elegance. This serene sanctuary will become your home away from home on your idyllic vacation. Exclusively private, this seven-bedroom villa offers you two opulent living space in sophisticated luxury. The Villa boasts well-manicured gardens, magnificent views of the turquoise Caribbean Sea, swimming pool, and a fairy tale stone path leading to the beach cove below. Get as far away from the ordinary as you possibly can! Picture yourself swimming in your own private pool, dipping in the clear blue waters of the sea, or just basking blissfully on golden sands, feeling the warm sea breeze, or simply staying in for a dinner of local delights, sipping cocktails under the stars by the gazebo or on one of the many cool-breezed verandas. The possibilities are endless at The Big White Villa. This 5-bedroom, 4.5-bathroom vacation rental home is the perfect base camp for all your holiday adventures! If you require more rooms, we have 2 Double-bedroom self-contained studio apartments for guests that want to have their private accommodation. This villa can be rented in a 5, 6 or 7 bedroom configuration. Boasting 9000 square feet of high ceilings and porcelain tiled floors, this accommodation comfortably sleeps 18 guests, managed by suitably qualified friendly staff (housekeeper, chef, house /security person). A prime location steps away from the beach. This is ideal for large groups or family getaways. Get ready to sit back, relax, and look out to beautiful ocean views, much better than pictures have captured and the sound of waves crashing from the front porch. Keep an eye out for grey whales jumping in the distance! This beautiful modern home is secured by automatic gates and is accessible by two drive ways and a walking route to the main entry. Walk through the front doors to find the spacious living area filled with natural light, plush leather sofas, a 60-inch 4K flat-screen Smart TV and a most exquisite designed bar, ready to be stocked with all your favourite alcoholic beverages. The updated and fully equipped kitchen flows seamlessly into the dining area, making it easy to entertain guests. Prepare your favourite home-cooked meal using the modern gas/electric cooker indoors then eat at the 4-person dining table on the veranda or why not go alfresco dining poolside. Each bedroom in the home features a comfortable queen-sized bed and en-suite bathroom. The master suite is complete with luxurious bedding for your ultimate comfort. Wake up feeling rested each morning as sunlight illuminates the entire room. The master bedroom en-suite bathroom hosts a hot-tub, double sink vanity unit and shower. The other full bathrooms feature a shower/tub combo and generous counter space for getting ready each day. The ground floor bedroom is suitably adapted with special equipment for assisting individuals who are elderly or mobility impaired. This amazing vacation home is located 5 miles from the centre of Ocho Rios, in a gated community, giving extra security and peace of mind to our guests. The villa is situated on a historical heritage site, Rio Nuevo Battle site which includes a museum and park. Ask any of the neighbours and they will only be so happy to tell the stories associated with this site. The area is peaceful and quiet enough for you to enjoy a relaxed environment, but near enough for you to travel to the hustle and bustle of Ocho Rios town centre if you so desire. Follow the pathway next to the home and you will stumble onto Rio Nuevo beach that joins the river. This beach is quite stony and rugged and more suitable for the adventurous type. Walk along the coastline, you will see all the beautiful silver sandy beaches that coast is famous for. There are several other nature parks and beaches just minutes away, such as Bamboo Beach or James Bond Beach. Take a 10-minute drive north to the town of Ocho Rios and all it has to offer with its trendy boutiques, antique shops and delicious restaurants. Be sure to stop by Fisherman’s Point to buy some fresh lobsters straight from the boat. The party will start the minute that you land on the Island. The Big White Villa is pleased to offer Airport transfers (one-way USD$25/Return USD $45 per person) from all International Airports (MBJ/KIN) with complimentary drink on arrival. Day-to-day transportation can be arranged for an additional fee. Our mission is to make vacation rental easy for guests. Our House Keeper and Chef will take care of your every need. On arrival you will receive a 'Welcome Hamper' and a warm smile. The Chef will meet with you at your earliest convenience to discuss meal plans and your dietary requirements. He will then buy the goods on your behalf and provided full receipts for payment. You are welcome to enjoy the vibe and learn about local food on your visit to the store. If you have questions prior to your trip, we are happy to assist you 7 days a week. During your stay, your designated Guest Contact will be available 24/7 to help with any issues that may arise. I love the villa because it is so spacious and airy with enough room for you not to be on top of each other and is walking distance to the beach and river. Close enough to the beach for you to hear the sound of the waves from any of the many balconies. We offer complimentary refreshments on arrival and a 'Welcome Hamper' to all guests. All weddings at the villa come with an experiencd Wedding Planner and the free venue hire. The view from the upstairs balcony is out of this world. Very relaxing and quiet especially for you to sleep well at night but close enough to the center of Ocho Rios with the hustle and bustle of the shops, bars and party vibes! There is also an outside shower by the pool. All bedrooms have en-suite bathrooms. There are both downstairs and upstairs living areas which have balconies allowing for exceptional views. The whole property is furnished to an extremely high standard and contains all the amenities you would desire on a trip away from home. Loved our stay! Great secure place! Kevin the chef was top notch! Thanks Paul for such a lovely review,glad you had a good time and the staff actually raved about you. The Big White Villa was the perfect size for our group of 12 and offered plenty of space for everyone. The house manager, Aretha, along with the grounds keeper, Sam, met us upon arrival and were very friendly and welcoming. All of the rooms offer an A.C. Unit however the unit in the master bedroom did not work. Luckily, there was a nice breeze the majority of the nights so between that and a couple fans we were able to sleep comfortably. The hot water heater was also an issue. Everyone got about 5min of hot water for a shower before it turned cold no matter how much we tried to stagger shower times. Again, we made it work but when paying so much for a vacation, I didn’t expect to be taking cold showers. I can’t say enough about Kevin, the chef, he was amazing! We asked him to make traditional Jamaican meals and he did not disappoint. Errol and Errol chauffeured us around and were very resourceful when when planning activities and answering any questions we had about the island. It was truely a pleasure getting to know them. Taneisha , the housekeeper, was so sweet and attentive during our stay. The beach is just a short walk away however it is very Rocky as the pictures show. There is an amazing little restaurant called “Sugarpot Ruins” about a 10 min walk down the beach that offers an absolutely beautiful beach though. Overall, we really enjoyed our stay and would definitely stay here again! Wonderful staff! Enormous amounts of room! We really enjoyed our stay at the Big White Villa. Kevin was a wonderful chef. Sam & Leticia were so warm and helpful. The rooms were large and gave us all enough room to relax. I would recommend this rental to anyone. Of which we are very pleased with. We had a great vacation in Jamaica. It’s a lovely place. The people are friendly and helpful. The drive down from Montego Bay to the Big White Villa was smooth. Our ride was through Travel Jamaica Tours and Errol Bowen who drove us down entertained us and kept us laughing all the way. He is awesome. He and Errol Williams did all our chauffeuring during our stay. They were a pleasure to work with. The staff at the Big White Villa were friendly and resourceful. The property manager worked with us to prestock food and supplies before our arrival. She was present along with the staff when we arrived. We love Kevin, our Chef! He whipped up delicious meals and accommodated our preferences and diet restrictions cheerfully. He went out of his way to help with other needs in the house as well. A shout out to Sam as well. He was a quiet gentle presence who unfailingly stepped up as needed. The house itself is a spacious and airy place that easily accommodated our group of 14. The location is beautiful. The landscaping is lush and tropical. We enjoyed the pool. The sights and sounds of the ocean are close by. The neighborhood is quiet and secure. All our excursions and shopping or dining trips were a short drive away. A little more attention to maintenance and housekeeping would make the Big White Villa near perfect. But for them the small annoyances would have been absent. As such it falls short of the ‘luxury’ tag. Nevertheless all in all we enjoyed our Jamaica experience. The food. The sights. And most of all the friendly folk!! We had some difficulty finding the Villa, the address provided did not appear on Google map, the property is marketed as Ocho Rios (which is largely in St. Ann) but it is actually located just outside of Ocho Rios in St. Mary. My other guests had similar experiences with finding the Villa. The actual accommodations were adequate, we had 5 bedrooms in the main house and 2 bedrooms accessible from outside by the pool area. They were good size rooms with enough amenities to be comfortable. We met the maintenance person, the house keeper, private chef and manager on the first day. Everyone was friendly and happy to assist in making our vacation enjoyable. The view from the upstairs balcony was amazing. The beach (while quite stony and challenging to access via a steep stair) was generally okay. The property is not air-conditioned in the common areas, each bedroom has an air-condition unit, however, we had to keep the doors open to maintain a reasonable temperature in the living room, kitchen, and upstairs lounge areas. Having the doors open also meant mosquitoes which were a bit annoying. There were a few maintenance issues (refrigerator beeped 24 hrs per day because the Freezer did not work, blinds in master bath were broken and could not close, door on shower was broken etc. etc.) but nothing that was a fatal flaw. The chef did an amazing job and cooked some really delicious local meals for us, however, I think the house cleaning had a bit to be desired and the dust did a number on my sinuses. The Villa is also located near a public park area and there was loud music which played every night during our four night stay. Honestly, we had a good time in Jamaica, we visited Dunn's river falls, the town in Ocho Rios, enjoyed local fruits, and other amenities. The Villa met our needs for somewhere to sleep (as we were out for most of the days) however, I wouldn't describe it as "luxurious". We had a group of 12, there was ample space for everyone and no one really complained. It is a great villa in a great location, it just needs a few tweaks in the maintenance area and I would give it at least 4 stars. We loved the big white villa. We were 12 people. 6 couples. The villa was very spacious and comfortable. Great for a big group. The staff was amazing. Kevin the chef cooked the most incredible meals. The location was great for experiencing the north side of the island. Rocky but very quiet and somewhat private beach a short walk down some steps. If you have more than 6 couples it might get too crowded as two of the seven bedrooms share a bathroom. The upper balcony with sea views is an amazing spot to have breakfast and all hang out. 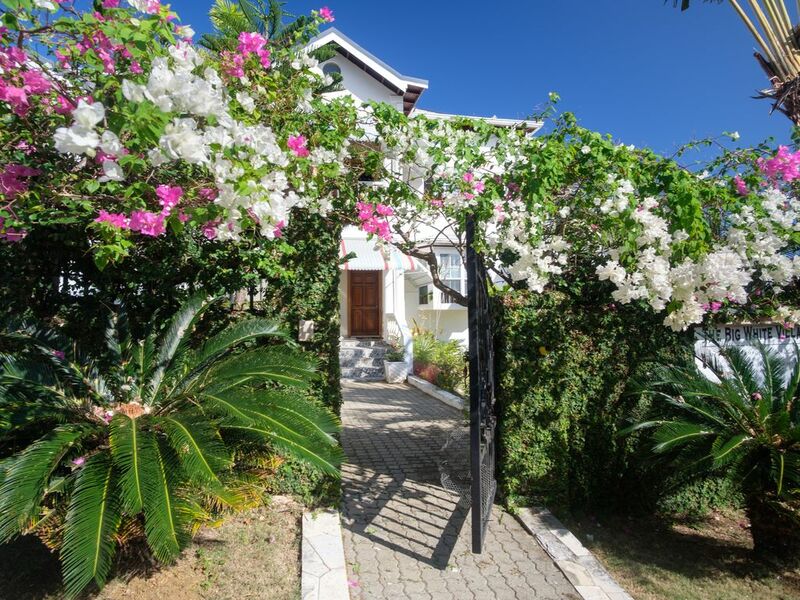 The Villa is located in a secured gated community just 10 minutes from the town of Ocho Rios, at the historical Rio Nuevo battle site and memmorial park. The place where the final battle between the British and Spanish forces was fought in 1658. Other famous attractions in the area, include the Dunns River Fall where you can swim in the river, find caves behind falls and mini-whirlpools. Ten minutes away is Dolphin Cove, where you can swim with dolphins. Close by is the Mystic Mountain which is located on rain forest terrain 700 feet above sea level and features a roller coaster ride and an aerial tramway canopy tour. At The Prospect Plantation Tour you will discover how a plantation site works, and enjoy open-aired carriage rides, horseback and camel rides; There is also a wonderful butterfly aviary and you can even feed the ostriches. Be sure to visit Golden Eye, the house where Ian Fleming lived and wrote all 13 original James Bond books.